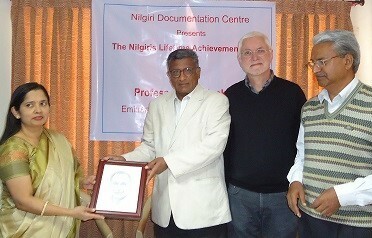 The Nilgiri Documentation Centre honoured Prof Hockings, in absentia, with the The Nilgiris Lifetime Achievement Award 2015 on February 23 when Prof Hockings turned 80 at a function at Lawley Institute, Ooty. Dharmalingam Venugopal presenting the award to Mrs. Shubha Somasundaram, Prof.Hockings’s friend from San Francisco, USA. Others in the photo are Dr.Sundaradevan, first Badaga IAS officer and Prof. Frank Heidemann, Professor of Social and Cultural Anthropology at the University of Munich, a German researcher of/on Badagas and author of ‘AKKA BAKKA’, who had visited me at Coonoor in 2011. Incidentally, Shubha is the wife of Somasundaram who along with his brother Devaraj are probably the only two IITians from Badagas. Both are in the US for long. They are originally from Porere Hatty, but settled in Keiya Bickatty, near Aravankadu. For :- Somasundaram/Devaraj – pl send a photo along with a write up about yourselves for being IITians for publication in this website as an inspiration for young Badagas who want to join IITs. In my opinion, Paul Hockings has been the scholar/researcher whose studies on Badagas may be considered to be very comprehensive. May not agree with some of his findings especially about the Badaga origin [that Badagas migrated from the Mysore plains] but the wealth of information that he has exposed in his books is greatly applaudable. 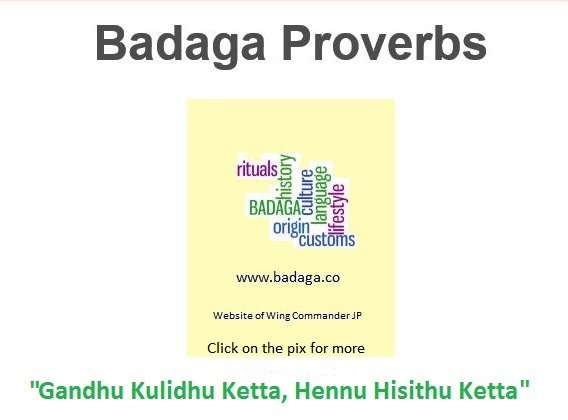 If I have to choose a single book out of many, without hesitation I would go for ‘Counsel from the Ancients: A Study of Badaga Proverbs, Prayers, Omens and Curses‘. Unfortunately, this book is very expensive but you can access most of the pages online. In this book, Prof. Paul Hockings, probably the most authentic researcher on and of Badaga, lists more than a thousand Badaga proverbs, 1730 to be precise. He feels that 1730 could be a complete figure containing all the proverbs there are. Though I find his collection extremely interesting and educative, I do not agree with some of the conclusions he draws on certain proverbs. For example, on the proverb, ‘Odhidhama Niddhana, Oddidhama Erandina’ Prof.Hockings interpretation is quite different to what I feel is the correct meaning. I think ‘a person who spends time learning and ponders (over a problem) is better than the one who runs away (in a hurry) and thus trips over. [Odhidhama – one who has learnt (spent time learning), Niddhana – stops to ponder over[think], Oddidhama – one who runs, Erandina – trips over]. We can hear mothers telling their young children ‘Oda beda , Erandire’ – Donot run, you will trip over (a stone or any obstruction). That is ‘ do not be in a hurry and take a hasty decision’. Given below is an interview that Prof.Paul Hockings has given to Dharmalingam Venugopal [NDC, Kotagiri] on 16 Feb 2015. Why is Nilgiris so fascinating for foreign scholars? There are several reasons. One is the extreme diversity in such a small area: biological diversity, yes, but also cultural and linguistic diversity. A district of just under 1000 square miles has roughly 17 indigenous groups, plus immigrants from all over South India and a smattering of Europeans too; and speaking a dozen Nilgiri languages plus English, Hindi and the major Dravidian languages. A second attraction is the scenic beauty of the district, which appeals even to the hard scientist, and always provides a pleasant, healthy environment to be working in. But perhaps the most attractive feature for scholars, Indian or foreign, is the amount of research work that has already been done here. Nilgiri research in the natural and social sciences stretches back two centuries. The bibliography of well over 8000 books and articles on Nilgiri topics is unmatched in any other area of South Asia that is of comparable size. This means that no matter what you plan to study there is already a large literature on the subject. That can mean more reading for the serious student, but at the same time it means that he or she does not have to start from scratch in understanding the topic of research. And the range of disciplines for which there is so much literature is itself large: agriculture, anthropology, astronomy, botany, climatology, costume, epidemiology, forestry, geography, geology, history, linguistics, literature, music, plantations, public health, religions, and zoology. How significant is Nilgiriology today? Because of this huge literature, scholars from numerous countries have often chosen to locate their research in the Nilgiris. One remarkable statistic from this district is the fact that its literature includes over 120 master’s and doctoral research theses: again, something that is unmatched in quantity in any other small region of South Asia. Is the interest in Nilgiris sustained today by the younger generations? Younger generations of scholars are still interested in working on the Nilgiri, and do so. There is no obvious falling-off in interest in the community. Younger Badagas are sometimes interested in their community’s history, but sometimes not. Those who have migrated to distant parts are often curious readers of the literature on Badagas, as they haven’t received much common lore from their relatives and want to know more about their culture. Is the focus of Nilgiris studies changing? In the natural sciences all the latest concerns may be read in today’s research literature, especially in the realm of environmentalism. Since the Badaga community have proved themselves to be forward-looking, and have successfully moved into the Indian middle class through their long-standing emphasis on education and a common desire to adopt urban professions, anthropological studies nowadays tend to view this community as a model for self-motivated development. I certainly hold that view. Why have you studied the Badagas for half a century? The main reason for studying the Badagas, from 1962 onwards, was that the neighbouring Toda and Kota communities were known worldwide through the anthropological work of Rivers, Emeneau and Mandelbaum, whereas the largest and economically dominant local community, the Badagas, remained in the shadows. Given that there had always been a complex ritual and economic interchange between these three groups, it seemed imperative that the Badagas’ role in it should be documented in detail. The fact that in the late 20th century Anthony Walker was doing a comprehensive re-study of the Todas made it all the more useful to examine the Badaga case in detail for the first time. How do you see the transformation of Badagas over the period? I have spelled out this transformation fully in my recent book, So Long a Saga: Four Centuries of Badaga Social History (Manohar, 2013). The major changes started early in the 20th century when a few Badagas began going to college, a few others started small tea plantations, and potato farming took off as a profitable commercial enterprise. With Badagas taking up positions in law, administration and teaching, their enhanced position in modern society was assured. The control of population growth through the adoption of family planning practices since the 1970s was another, equally important factor in their modernization. How long an existence qualifies a people/group to be called natives? This has never been determined by social scientists, and perhaps cannot because it depends very much on how the group behave and what attitudes others develop towards them. In this regard I like to draw a contrast between the English and the Parsis. The English have been in England for about 1500 years and everyone, especially they themselves, consider them as natives there. The Parsis have been in Western India for nearly as long, perhaps 1200-1300 years, yet very many would hold they are not Indian natives and they themselves make no attempt to hide their cultural origins in Persia. The English, in contrast, are unaware of their origin in Schleswig-Holstein. So it is more a matter of attitude than of the actual number of years involved. How do you define the Badaga society today? The Badagas do still have a distinctive culture which sets them apart from those of their close neighbours, the Todas, Kotas and immigrant groups from the plains. 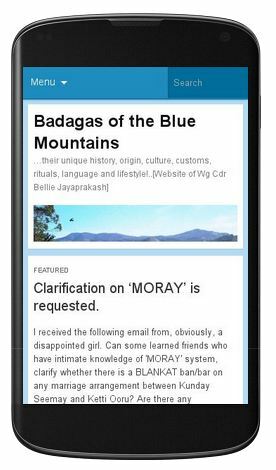 For an anthropologist two features define Badaga society today: use of the Badaga language, and intermarriage only with other Badagas. Thus there can be little argument about whether some particular individual is a Badaga or not. The term “tribe” was a useful one, universally used by British administrators in India to describe and census categories of the population that were not embedded in the caste system as Brahmins, Kshatriyas, Vaishyas or Sudras. Tribes tended to have their own territory, often their own language, their own system of leadership, sometimes a distinctive economic base, and certainly a tribal name. All of this helped distinguish a tribe from a caste. But quite recently anthropologists have been abandoning the use of the word “tribe” in India for the equally ambiguous phrase “indigenous community” — ambiguous, as I have stated, because it is unclear how “native” any particular group is. This however is the term I would now use to identify the Badaga community. Two centuries ago Badagas were already telling inquisitive visitors that their ancestors had come from a small block of villages just to the northeast of Nanjangud after the Vijayanagar Empire broke up. There were even a few Badagas in Melkunda in 1603 who spoke to a Jesuit visitor, Fr. Fenicio, in Kannada, and gave their name as Badegas, “northerners”. Since that crucial move Badagas have embedded themselves totally in the larger Nilgiri society, becoming like a tribe among tribes. I can not agree with Prof.Paul Hawkins. We are aboriginal tribe. There are lingayats in our community, Britishers spoke with them and wrote books. Lingayats speak in a tongue related to old Kannada and they still marry from Mysore. We have strong evidence which which says Badagas lived in Nilgiris before Christ was born. Recent research done by a French scholar Christiane pilot Raichoor says we are aboriginal tribe of Nilgiris.